I was up at 4:00 a.m. and hoped I could make it out the door by 5:00 a.m. with gear, two little sleepy girls, and a cooler full of food. My 4 year-old was up at 4:30 a.m. and decided she needed to wait in the car while I finished getting everything ready. I sure do love that girl. We somehow managed to make it out the door by 5:00 a.m. and during the entire drive I kept thinking I forgot something (I didn’t forget anything and triple checked before leaving the house). When you do a race and take young kids with you, the amount of stuff you are accountable for is ridiculous and I think I had more anxiety about forgetting something than actually racing. We arrived at the venue at 6:15 a.m., giving me 75 minutes register, get marked and set up my transition area, all while toting a 2 year-old around. I needed every last-minute. After registering and getting marked I went back to the car to get my gear bag, wetsuit, bike, 4 year-old and 2 year-old. With gear bag on back, wetsuit on handle bars, 4 year-old walking and 2 year-old on hip, off to transition we went. 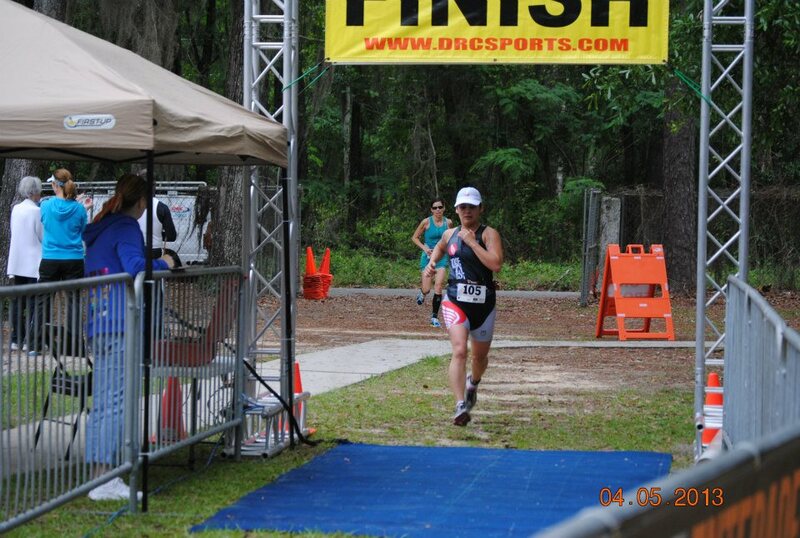 Thank goodness this was a very small race – there were no assigned transition areas which allowed me to set up close to the edge of the fence with my kids. It was about 7:15 when panic set in…. I had lost my cell phone…. We set off on a serious jog (again, with kid on hip) to the car, to the registration table, to the bathroom, and back to the car. Luckily, it turned out to be in the car, right where my 4 year-old had hidden it. By the time we found it, it was nearly 7:30 and it seemed like everyone was in their wetsuit getting a run-down by the race coordinator. 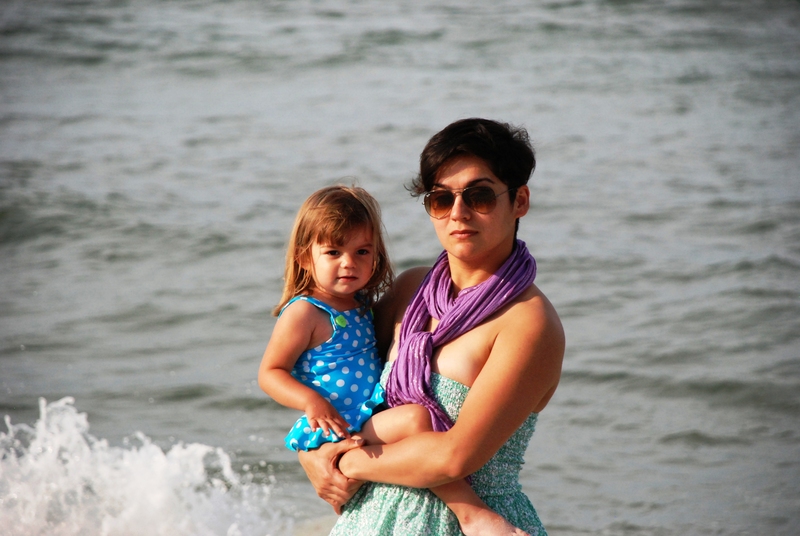 I took off back to transition (with kid on hip) and trying to hurry up my 4 year-old. In case you don’t know, 4 year-olds only have a sense of urgency when they have to pee or when candy and a sibling is involved. So, try as I might, I had to be very delicate about encouraging my 4 year-old to HURRY UP!!! 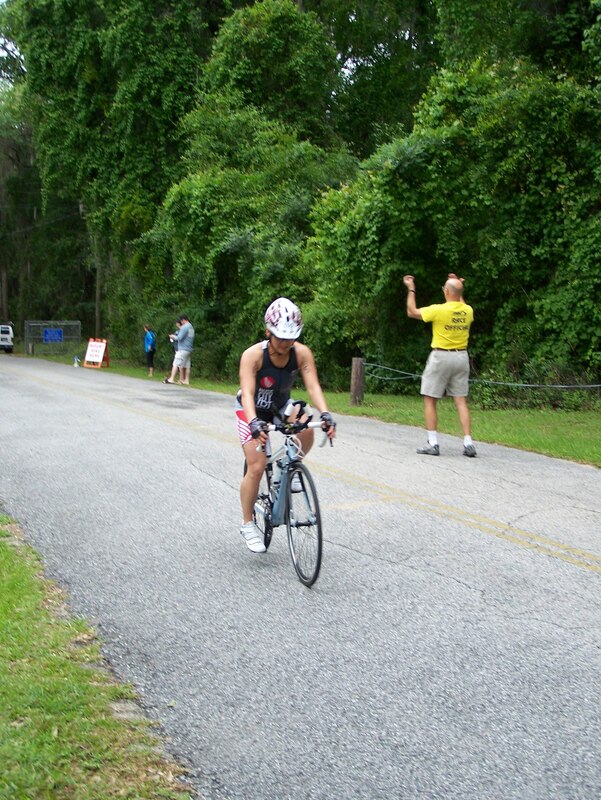 I ran into transition, hot and sweaty at this point and attempted to get my wetsuit on in a hurry as my 2 year-old grabbed my leg and kept asking me to pick her up. I was getting looks. I managed to get my wetsuit up to my waist and picked up my 2 year-old and the three of us walked over to the water start. 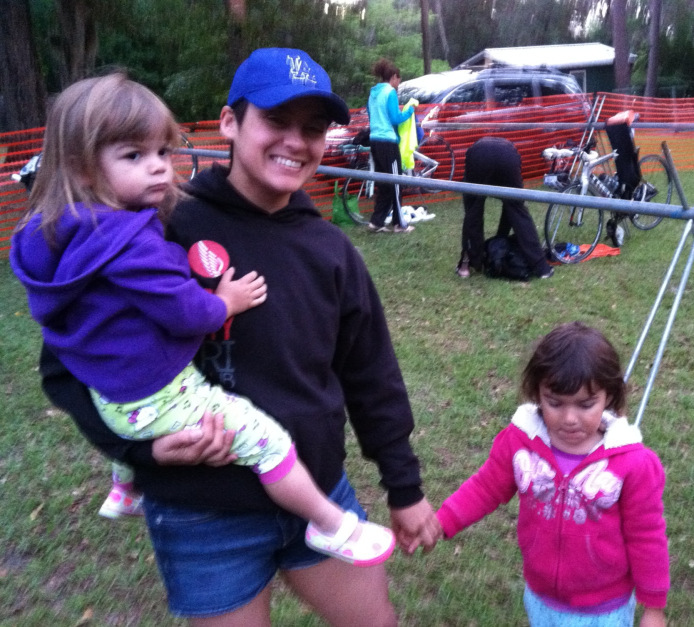 At the water start, I tried to hand off my 2 year-old to the utmost amazing tri mommy (with her own 2 year-old in tow) and Half Ironman veteran that was out to support her hubby that day. I wish I had a picture of me in full wetsuit, yellow swim cap, and kid in pajamas on hip. After the Olympic start, I managed to get my 2 year-old to sit down and be distracted as I walked around and made it to the water. Even as I waited for the horn to blare for our swim start, I still did not know if my 2 year-old was going to let me race. Somehow, things worked out. The swim went well, for the first time ever. I didn’t panic, but after rounding the first buoy my right shoulder felt tired and I wasn’t full of adrenaline. I realized that running around with 30 pounds on your right hip for an hour will make your arm tired and you will feel it on the swim. I also realized that I used up all my anxiety waiting to see if I would even start the race and by the time we started I was more relieved than anything. After getting out of the water, I was pretty dizzy but kept on moving. As I jogged up to the transition point I could see my lil girls sitting on blanket and waving to me – Definitely an awesome moment for this mommy. The bike consisted of one loop around the lake. At the start of the bike leg I wondered how I was going to do. Due to the race being so small, I really had no idea of how far to the back of the pack I was; I knew I was at the back of the pack because swimming is not my thing. I purposely did not wear a watch, so I really had no idea of how I was doing. I passed a few people on the bike leg and some I passed while climbing hills. 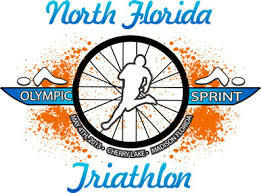 As I finished the bike section and pulled into transition, the amazing tri mommy had put the kiddos on a blanket near the bike end/run start and she pointed to me as I came in on the bike, which also meant I saw them as I exited for the run. Once the race results were posted, I was excited to see that I rode about 17.6 mph and had a finish time of 34:12…… I knew I could ride faster than 11 mph. When I got out on to the run portion, I wasn’t sure if I was even on the right course since I didn’t see anyone in front of me. The run starts around a blind turn and then up a hill. Once I got to the top of the hill I saw folks in front of me and I realized I was on course, which also allowed me to settle into actually running. About a mile into the run I dropped my gloves and had to back track to pick them up; I had to of lost at least 30 seconds. After the 1.6 mile turn around point I settled a little too comfortably into a slower than usual race pace. The last blind turn to the finish line came quick and I picked up the pace, but overall did not give the run all I had. I still managed to run a 26:17, which is a new PR for me. As I crossed the finish line I saw two little munchkins ready to love and celebrate with mommy. Overall, I placed in middle of the pack with my actual times putting me in the second half of the pack. 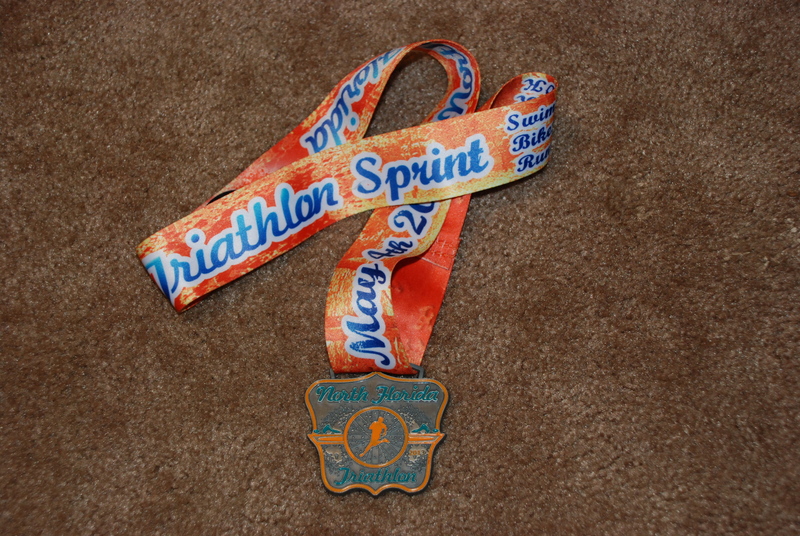 How did I place 25th overall (men and women) when my swim and run placed me in the second half of all athletes? I guess I was quicker than I realized in transition. “Recovery Week” has quickly turned into 2 weeks. I did manage to get in a bike ride and a few short runs, but the craziness that is involved when racing with 2 kids was quite a bit for this mommy to deal with. We had a family weekend getaway to the beach last weekend and I took my bike, thinking I was going to get in some serious miles on the bike and then maybe knock out an evening run. 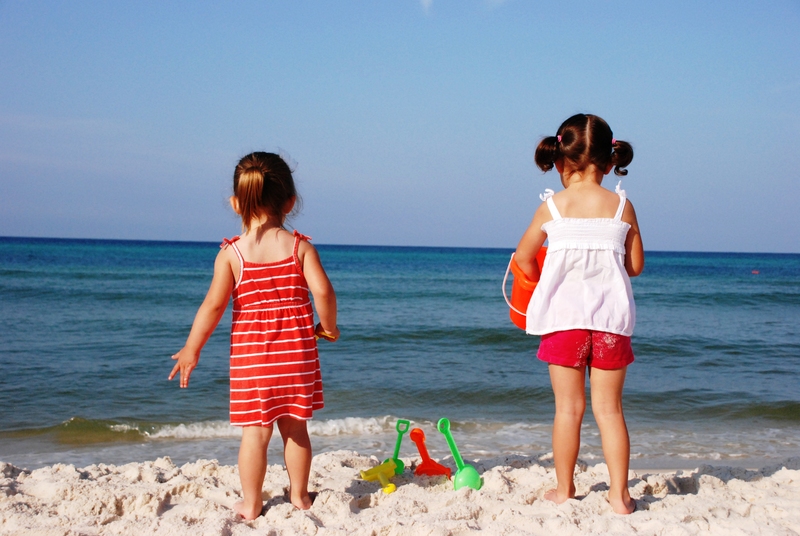 Neither happened, but I did get to play in the sand with my girls all weekend. I’d love to jump back on the wagon right now, but with Tough Mudder coming up next weekend, I know I have a few days to train and will then have to taper off to prepare for the grueling 12 mile run with obstacles. You are a “tough mudder!” Your amazing Jen!! You had a GREAT race! Congrats!!! Thanks Lori! Just getting to the start was the biggest challenge. Congrats! I love the spirit and the drive you took from your last race! Glad your swim went better. I’m pretty sure if I ever tried a tri I would drown! LOL Good job! Thanks Colin! You wouldn’t drown, most of us think that…. Yet, we are still crazy enough to go for it. Wow, I got tired just reading about your day. You did great! Keep it up in some form your whole life. You can pass the torch of health to your Treasures. Thank you Lisa. I hope that by watching me they can develop their own passion and be willing to work hard for what they love.